The issue brought together key figures in the religious right, like Jerry Falwell, Bob Jones, and Paul Weyrich, and they made it their mission to defeat Carter’s reelection bid, hoping the next president would put the IRS and EEOC on a shorter leash. But to build their movement publicly and nationally, they needed an issue that would stir a broader base of sympathy, branding them as believers instead of bigots. They picked abortion — namely, demanding a constitutional amendment to outlaw it — and they enjoyed a resounding success. Carter refused their demands and lost. Reagan, the candidate they endorsed — and whose party supported their demand in its official platform — won by one of the largest margins in history. Reagan also had the distinction — albeit one he publicly rebuffed — of being endorsed by the Ku Klux Klan (KKK) in both 1980 and 1984, in large part because of his opposition to affirmative action. The Klan, of course, shared some of the same views as those Southern segregationists who had helped put Reagan in office, but they took those views to more extreme conclusions. Their views on abortion, it turned out, followed much the same pattern. The union of racist ideology and anti-abortion politics that helped bring Reagan to power had a more underground counterpart that developed in the 1980s, one that existed largely outside the arena of electoral politics. The rhetoric of hate groups began to echo fears from a century prior — fears that had fueled the prohibition of abortion throughout the U.S., before its eventual legalization in Roe v. Wade. In the late 19th century, waves of immigration generated concerns about a vanishing white race. The birth rate of Anglo-Saxon women, the idea went, could not afford its losses to legal abortion when immigrants were arriving and multiplying at such an alarming rate. In a similar vein, in the 1980s, the KKK and other white supremacist groups began making the charge that abortion was the tool of a Jewish conspiracy to eradicate the white race. Did you know that most abortionists are Jewish or other non-whites … and that the pro-abortion movement is headed by unfeminine feminist Jewesses who counsel non-whites to not get abortions … and did you know that abortionists slaughter nearly one million white babies every year? Jewish ritual murder is alive and well in the United States of America … and is very legal! Eventually, the anti-Semitic brand of anti-abortion politics that was peddled by WAR and the KKK took root outside the ranks of self-identified white supremacists. 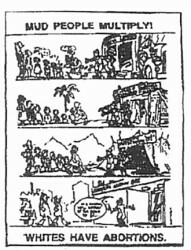 On a 1989 broadcast of WVIT’s “Connecticut News-makers” program, Robert Cooley of the Pro-Life Action Network commented that “affluence and comfort lead to abortion” and that “the majority of abortionists are Jewish.” Both Randall Terry of Operation Rescue and members of the Texas-based Life Dynamics, Inc., have made similar claims about the disproportionate role Jewish doctors have played in abortion provision. Loretta J. Ross, a visiting associate professor of women’s studies at Hampshire College in Massachusetts, has done extensive research on the connections between white supremacist and anti-abortion movements. Ross posits that both ideologies are enabled by a Christian fundamentalist doctrine that puts Biblical law above civil law and justifies violence as a means to carry out God’s will. The doctrine provides a theological home for the extreme beliefs that are the bedrock of both white supremacist and anti-abortion ideology, holding that whites are God’s chosen people and that their unborn must be protected from abortion. Ross and her colleagues began their project, which they named Women’s Watch, six months before the first assassination of an abortion provider. John Burt, the first of the “crossover people” she discovered, was responsible for indoctrinating the perpetrator of that assassination, and he continued to be at the center of many news reports about anti-abortion violence in the 1990s. Some of the earliest mentions of John Burt go back to 1985, when he came out in support of a small group of anti-abortion extremists — Matthew Goldsby, Kaye Wiggins, and James and Kathy Simmons — as they stood trial for a series of clinic bombings in Florida. Burt was 43 years old at the time and recounted how he abandoned a history of alcoholism, drug abuse, and check fraud to become an activist for the religious right: “One day I was sitting up late at night doing speed and looking through an old Bible.” That’s when he decided to go to church and get clean. His newfound religion soon led him to found a home for unwed mothers called Our Father’s House. It also led him to form an anti-abortion group, Rescue America, and picket outside the Ladies Center in Pensacola, one of the clinics that Goldsby, Wiggins, and the Simmonses bombed on Christmas Eve of 1984. In 1986, Burt faced criminal convictions of his own after breaking into another area abortion clinic and damaging furniture and medical equipment. It was at Our Father’s House that Burt later met Michael Frederick Griffin, who arrived as a volunteer and soon became both an acolyte and Burt’s hired handyman. Burt groomed him to be an activist in the anti-abortion movement, taking him to demonstrations and showing him graphic propaganda videos. Griffin didn’t have the kind of sordid backstory, like Burt’s, that would explain the wild-eyed redemption he found in the movement, but it provided a space for his radical religious views — and, later, his temper and violent streak. He spent time at the Brownsville Assembly of God in Pensacola before its reverend decided his “radical behavior” didn’t belong there. In 1991 he was fired from his job at a local skating rink after he assaulted a customer. According to his manager, “He back-armed a kid, and knocked him down.” The same year, his wife filed for divorce, claiming she had been verbally, emotionally, and physically abused by him. The following year, 1992, saw a new kind of crossover from white supremacist groups to the anti-abortion movement. 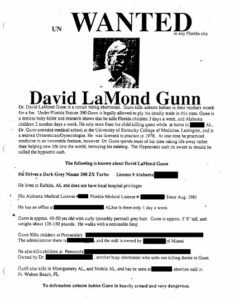 Much like the White Patriot Party’s 1985 “Wanted” poster targeting Dr. Bernard Nathanson, Randall Terry issued a poster targeting a Pensacola abortion provider, Dr. David Gunn. It not only bore his photo but also provided his home address and telephone number. The poster charged him with “murder and crimes against humanity,” with “defenseless unborn babies” as his victims. Following Terry’s lead, John Burt began distributing more posters of Gunn, featuring his photo and other identifying information. Burt would later deny responsibility for the violence he had provoked, arguing, “If I am a general with troops under me and give them a game plan and send them out, I can’t be responsible for every soldier in that army.” Speaking in military metaphors to distance himself from violence was much like the way he spoke of leaving the KKK — by also commenting on how they could someday find themselves “fighting for God and country” together. A photo that appeared in a 1993 issue of Time pushed the military theme even further, showing him dressed in combat fatigues. Burt was designated a court witness in the murder trial of Michael Frederick Griffin, and Griffin’s lawyer argued that Burt was responsible for brainwashing Griffin and pushing him to a “nervous breakdown” that led to his lethal outburst. In spite of the defense, Griffin was convicted of first-degree murder in 1994. Though Burt would walk free after Dr. Gunn’s murder, he was arrested years later, in 2003, on five counts of criminal conduct for molesting a 15-year-old girl at Our Father’s House. After his arrest, other residents came forward with similar stories of sexual abuse. Before Griffin’s conviction, he and Burt were early figures in a tide of anti-abortion violence that continued through the 1990s. Arson, bombing, and the murder of clinic staff and volunteers saw a dramatic rise during the decade, instilling a level of fear and uncertainty that has had a lasting impact on reproductive health services. That period of violence would reveal further connections between racial hatred and anti-abortion activism, as a growing, militant movement saw racial diversity, civil rights, feminism, and reproductive health services as signs of a tyrannical shift in the federal government. In the next and final installment of this series, we’ll explore the “Patriot” and militia movements that emerged in the mid-1990s and their ties to white supremacist and anti-abortion violence — as well as the synergies that developed between the right-wing fringe and the conservative establishment that influence politics today. 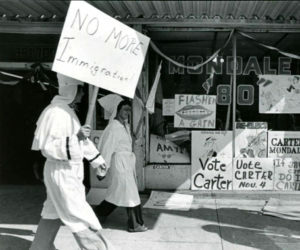 This entry was posted in Abortion, History, Racial Justice and tagged abortion, affirmative action, alcoholism, Anglo-Saxon, BBC, Bernard Nathanson, bible, Bob Jones, bombings, Brothers in Arms, Brownsville Assembly of God, check fraud, Confederate, Confederate Knights of the Ku Klux Klan, conspiracy, David Gunn, divorce, drug abuse, EEOC, Equal Employment Opportunity Commission, feminist, first-degree murder, Florida, Florida Department of Corrections, genocide, God, Hampshire College, immigration, Internal Revenue Service, IRS, James Simmons, Jerry Falwell, Jewish, John Burt, Kathy Simmons, Kaye Wiggins, kidnappings, KKK, Ku Klux Klan, Ladies Center, lesbians, Life Dynamics, Loretta J. Ross, Massachusetts, Matthew Goldsby, Michael Frederick Griffin, Milton, murder, NAACP, New York, non-whites, Our Father's House, Paul Weyrich, Pensacola, Planned Parenthood, Pro-Life Action Network, Randall Terry, Rescue America, Robert Cooley, SCLC, sexual abuse, Smith College, Southern Christian Leadership Conference, speed, St. Augustine, Texas, The Confederate Leader, Time, Tom Metzger, treason, WAR, White Aryan Resistance, White Patriot Party, women's studies, Women's Watch, WVIT by Matt. Bookmark the permalink. I always thought white supremacists were tied to southern democrats, you know, the ones that opposed the Civil Rights Act, the ones that started the KKK and so on. I also always thought the right wing folks were the ones that opposed racism and in general, breaking the law. Really though, a few minutes of research can make a person a good writer. I’ll pass on your kool aid. This article isn’t about Democrats and Republicans. It’s about white supremacists and abortion opponents. But I would also concur with what Anna wrote—that the article above is about the alignment of anti-abortion views and hostility toward civil rights, irrespective of anyone’s party affiliations.